The Avengers International Fan Forum :: View topic - Series 1-3 - Better on Blu-ray? Series 1-3 - Better on Blu-ray? If the 576 line source were literally upscaled to 1080, then might as well stick to the current DVD encoding. If the telecine film were scanned by a 1K scanner or higher, then I would be for having it on Blu-Ray. But it's only going to be 405-line in either case (that's the resolution of the telecine'd source) and would look exactly the same. The only visual advantage of BD might be removing some compression artefacts, if any currently appear. Sorry. Been meaning to reply to this much much sooner, but things got in the way. Notice that some of the PAL lines don't line up with the EMI lines. In the PAL output, this would be of a brightness that is the average of 2 EMI lines. A third of the PAL lines are in this situation. No such average brightness would have appeared in the original EMI output. So the PAL output is less faithful to the EMI output. Compare this with the HD lines. Yet again there are lines that are between EMI lines. But this is compensated for in the HD lines shown by (1) less of the lines being in between EMI lines (to me, only HD lines 9 and 12 out of the 20 in the diagram are badly out of line) and (2) the lines being narrower due to the higher resolution. The upcoming Blu-Ray has been done for German and English, which in some ways makes very good sense. But on further thinking, what surprises me is that Studio Canal, a French based company, didn't also include French together with the other two languages! I wonder what other "territories" will get a release of the upcoming Blu-Ray? Hopefully the Blu-ray pitches are correct, since they are the mono tracks. I think the Lionsgate Blu-ray have a pitch shift because they used the 5.1 remixes (or 5.1 fold down for the stereo versions). The reason this went undetected is that those mixes are from 2008/2009. They were stored and not used before Series 5 surfaced on iTunes and then on US Blu-ray. I suppose they didn't realise those audio masters were also wrong. Regarding the Blackman series on Blu, there are several reasons this would improve in HD. - First, I have seen them in HD on arte TV. They look way better than on PAL disc. - H264 codec makes for better compression and image definition than mpeg2 codec. - Less discs to contend with, easier to binge watch the episodes. - I think the remasters were originaly made not in standard definition, but in HD. - Even if the extra detail is minor, you get versions that are transparent to the original master, which is absolutely not the case with mpeg2 DVDs. In a word NO! Standard definition on bluray only confuses the consumer. A dvd source will capture all 376 visible lines of the source be it PAL or NTSC. I am not saying the bluray wouldn't look better maybe .1% if that. Series 4-6 were shot on 35mm film and a true 4K scan is needed to capture all the resolution. I believe the scans were 2K and the masters look great so no complaints and the bluray discs look good even the US one with its 12 mbps bitrate. The british version should improve on that with bitrates doubling. The point is though that it wouldn't be standard definition, Tim. Yes, I don't think the Blackman remasters were made on standart definition. It's obvious watching the arte airings in HD. Of course there is a limitation to the source material, but in any case, it looks better in HD than on the current DVDs. Now don't expect a huge leap, but expect a nice one. More pleasurable to the eyes. They were likely upscaled. There'd be no resolution increase otherwise. It would just be nice to have them on blu ray and maybe they might do some more clean up work on the episodes but if no more clean up then it would just be nice to have them on blu ray just like the rest or the series. True, there doesn't seem any point in NOT doing them on BluRay. They would be at last as good as DVD (no compression hopefully) and some people prefer the format for space-saving and other reasons. Hopefully much more archive TV can come out on BD; sadly the BBC think the format doesn't sell well enough for TV, only for films. But that leaves the licenses (and ITV stuff) open for others to exploit. If the masters were made in HD (those are 35mm telecine if I'm not mistaken) the resolution is better in HD and there's no upscaling since the source is a print, as bad as it is. You can't make extra resolution where none is there. The telerecordings were suppressed field recordings, which already had only half the lines (due to field suppression) of the 405-line VT masters. It's unlikely they'd have used 35mm to make suppressed film recordings - even for Stored Field, 16mm was standard. And it'd make no difference anyway save for the size of grain. If they'd been stored Field recordings, you'd have got more lines, but still far fewer than modern SD. The DVDs have squeezed out all the resolution that is there in the less-than-203-lines / suppressed field telerecordings. IIRC, the write-ups in Dave Rogers's publications were that the Gale telerecording negs were 16mm. Pretty sure they are all stored field, Franky. I stand corrected. That's good news, Alan. I still maintain they wouldn't be 35mm though! I'd be amazed if they were - it'd be costly over-engineering for early 1960s foreign sales of a 405-line VT show. so the 'new' releases are a IMPROVEMENT ???? visually and sonically ? It's not really extra resolution that you gain by using an HD scan. The gain is that you'd get a more accurate rendition of the film source. As shown in the diagram at the start of this thread, the problem with using PAL is that a significant number of PAL lines (about a third) will be in between two EMI (378i) lines. The resultant PAL line is the "average" of two EMI lines. This "average" line is not in the original film source. It could be said that these PAL lines are artefacts. If the HD images on a Blu-Ray disc were just an upscale from PAL, then you would see these "artefact" lines in HD! You might as well have the images in SD on the Blu-Ray disc and let the TV or Blu-Ray player do the upscaling. 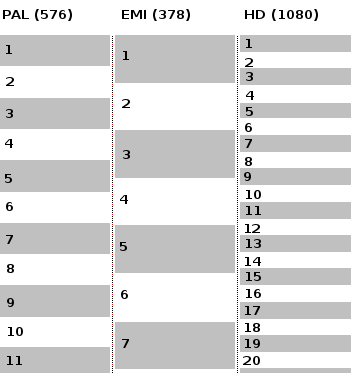 Though there are HD lines that are in between two EMI lines, the diagram at the start of this thread shows that there aren't that many HD lines that are severely in this situation. Also, for any HD lines that are problematic, due to the fact that HD lines are narrower, such problems would be much less than with PAL. Definitely 16mm, but as Network have proven with Robin of Sherwood and The Sweeney, there's plenty of detail to be had from 16mm. The format is of a higher resolution than SD video. Oh, sorry, I meant 16mm. 16mm resolution is about to 2K so they must have scanned these in HD, thus, the HD version blows the Pal mpeg2 SD version out of the water. I've seen them on arte, compared to the Pal disc, the Pal discs are unwatchable. HD adds a polish of extra detail. So yes, bring them in HD so that they are transparent to the source, which mpeg2 encoded DVD never will be. I wouldn't complain if they did, but the film series and especially The New Avengers are my priority for now! Where it is a series made on film, yes. The 405-line Doctor Who telerecordings that also had tender loving care from the Restoration Team are the best that those shows can ever look (although still below SD resolution where SD is 625-line PAL equivalent), but sadly the telerecording negatives for The Avengers weren't even looked after as well as the BBC ones. Even the 625-line ones that the BFI held (as near modern broadcast quality as possible) still wouldn't be up to HD (or made-on-16mm film) standard. Maybe someone could try some upscaling though. Maybe even a domestic BluRay player could upscale them adequately. It wouldn't work as well for 405-line ones. Did you know Robin of Sherwood was made using 35mm lenses adapted for the better depth of field, etc? Ian Sharp was a very clever director. I wasn't saying that HD transfers of 405-line 16mm film recordings would equal the picture quality of The Sweeney or Robin of Sherwood. I meant that 16mm film holds more resolution than SD video. It is of sufficient resolution to capture the full line structure of 405 line video, which, as this thread has explained, SD video is not. I recommend you read the technical posts over, as they explain why and how there are gains to be made in making HD restorations of the telerecordings - and those technical explanations would apply equally to Doctor Who. Why else would the Restoration Team scan telerecordings in HD to extract the necessary fine detail for colour recovery, for instance - and trust me, they have done this.